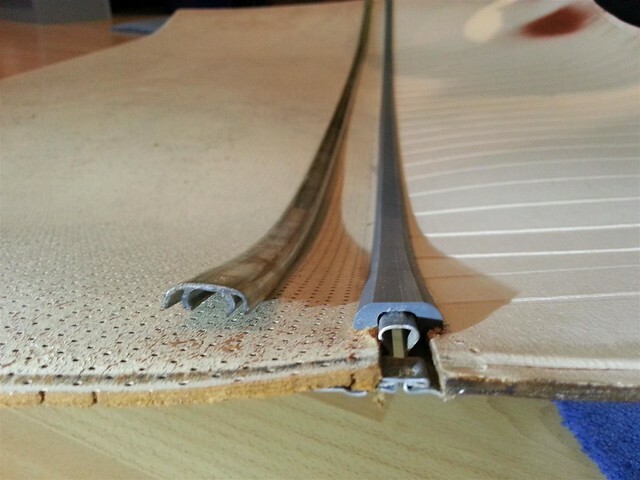 This thread gives instructions for making a scratch build headliner, based on the original 57/58 3 –sectioned cardboard one. 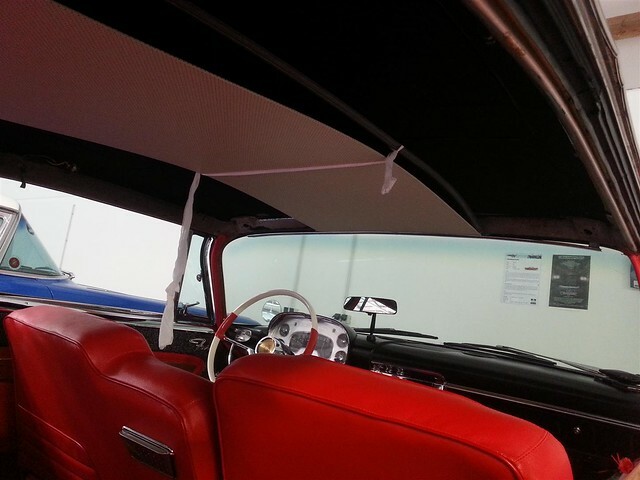 As mentioned, my friend Michael just finished his Christine restoration and also made a perfect new headliner. It is a bit tricky but it works. Look at the pictures below, the result speaks for itself. Part 1: General description about how it works and what material is needed. For the final assembly and final adjustment work, the car itself is needed. There´s no way for replacement parts "ready to go" without the car. The side panels are bended in 2 directions. The rounded shape cannot be measured exactly in advance without a mold. • Fiberboard for the middle section, 1 x 1565mm x 585mm, (61.61“ x 2303“), thickness 3mm (0.12“). One side coated is best. Like the ones you can get for cabinet rear walls. • White vinyl, dotted, from SMS or another dealer. SMS “1956 Buick dot” matches the grid perfect! 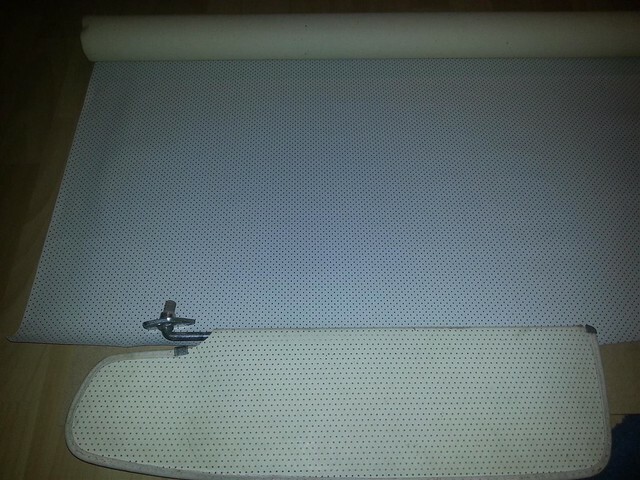 Dotted not perforated avoids problems with glue coming through the holes. Alternatively you can try to find perforated cardboard. We did not find it. I think that originally the holes had a venting function to dry the old “sheep-like” insulation material. Replacing it with modern stuff, a venting function is not needed any more. See insulation material below. Buy some more if you would like to cover the old sunvisors! • Solvent-free white paint and clear coat spray ( 2 layers). I would recommend mat clear coat, not glossy. Try out on a piece of board what´s best. • Remove all garnish inside moldings. 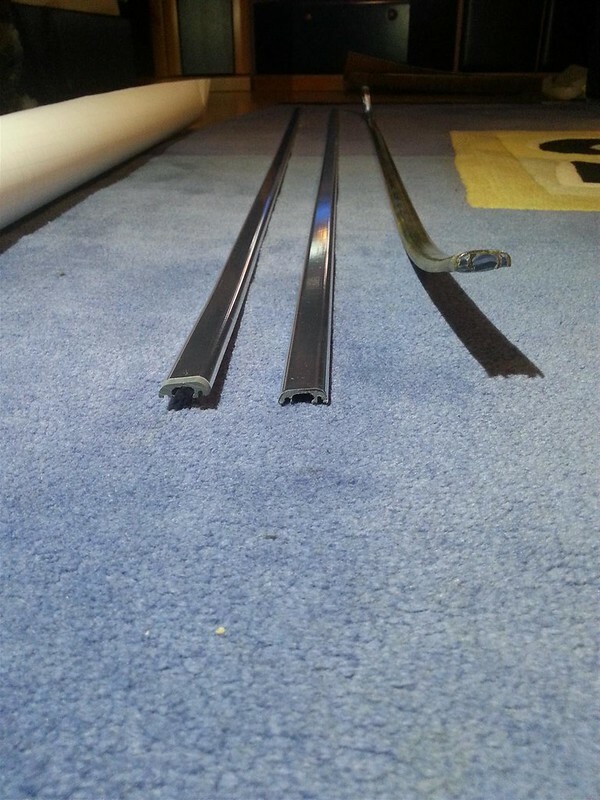 You may have problems removing the long bows above the windows as the screws are hidden under the roof rail weatherstrip. I managed to get them out, but did not reinstall every screw. In doubt, the weatherstrip has to be removed. • Remove the plastic retainer strips. Be very very careful if you want to reuse them! They may be very brittle due to age. Even if you get them out without breaking them: They may break if you try to push them on again after all. We come to replicas for that later. • Remove all 3 panels. Save the small clamps which hold the side panels up on both sides, above the windows. • Remove the “old dead sheep” insulation. Remove all loose material, also rust, from the metal. • Put Rust prevention paint on the roof sheet. 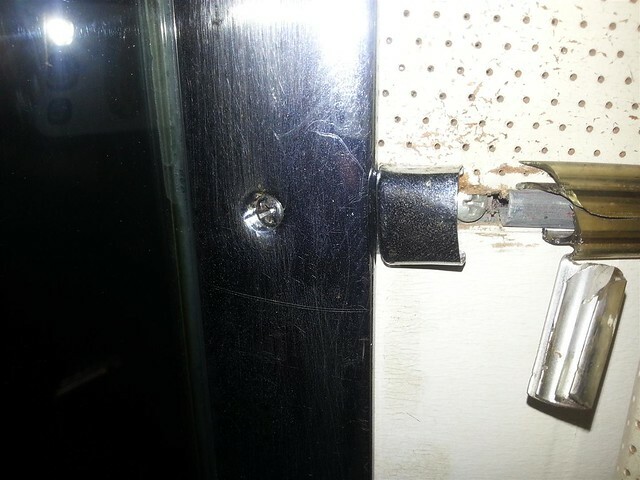 You will have problems to get behind the frame inforcements . 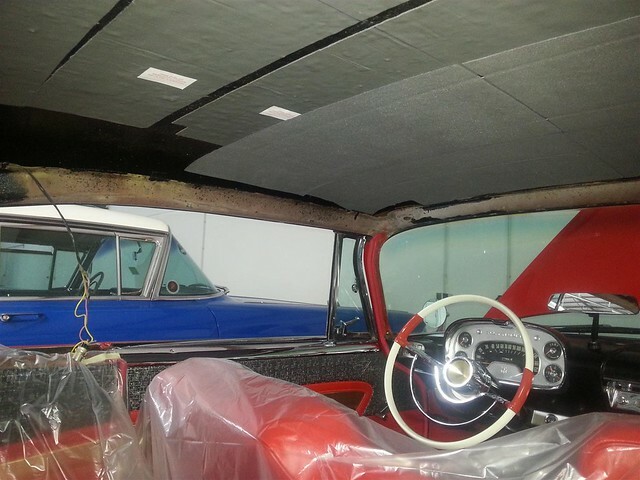 • New 3 layer insulation: Ant-echo, condensation barrier and soundproofing: That´s what I used. • The drawing is to scale. You have to find someone who has a big CAD plotter. Maybe some copyshops have those printers or someone else you know. • Cut the fiberboard for the middle section to 1565mm x 585mm, (61.61“ x 2303“) Mount it in the car between the metal retaining strips. You may have to tie it up somehow. Otherwise it could fall down because just the clamping between the metal strips is unsufficient. • Cut the foam boards with a carpet knife or scissors to the aproximate size. If you don´t have the old cardboards, my measured sketch will help. Be genorous with the size, you can cut away more material later! Try to fit it in the car. • Cut the grooves 1mm (0.04“) deep in the foam boards with a wood jointer. In case of doubt, ask a carpenter to do that job. Carefully break the edges with a spar and abrasive paper until they are slightly round. 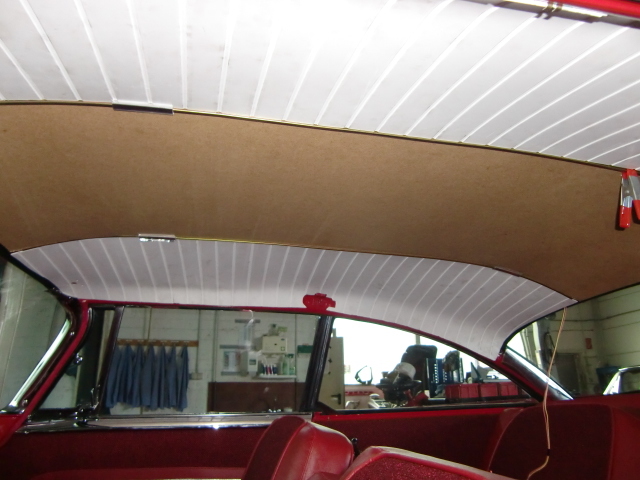 • Fit the foam boards from the outside to the inside, towards the metal strips. While doing that, use the heat gun for all the bended areas to carefully form it in shape. Maybe you have to cut away something again. Do it along the strips to make it fit. Work in small steps, this is an itarative process! • Mount all the chrome strips and the plastic retainer strips (if you have them) provisionally to check if all the edges of the boards are covered. 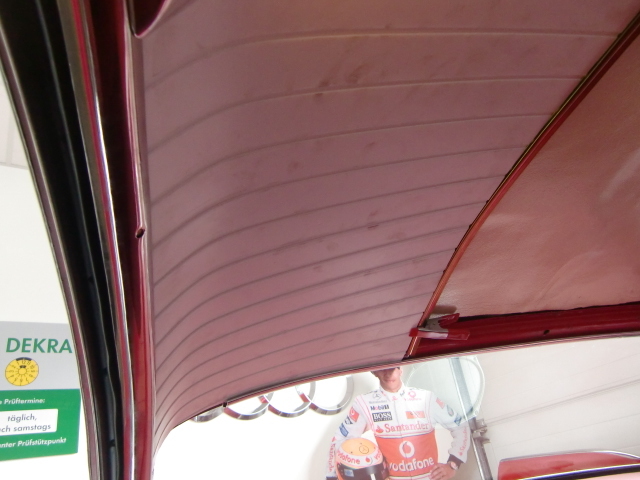 • Drill the holes for the sunvisors. Check and cut the recess for the dome light. • Remove all parts and fit them in again to check if everything is fine. • Cover the middle section with the vinyl. In case of doubt, ask an upholsterer to do that job. Important: Thickness including the vinyl cover should not exceed 0.16”. Let the carpenter mill 0.04” away this way. • Paint the side sections white. • Do the final mounting. Middle panel, side panels, plastic retainer strips. • If you are satisfied with the result, drink a beer or more and listen to the song from Dave Dee, Dozy, Beaky, Mich and Tich: Bend it! All in all, this is not the Legend of Xanadu! Be proud! • Reuse your old ones, if you have and they do not break. • Find used old ones in good condition. Good luck! I´ve made a CAD drawing of the profile and asked about 20 companies making plastics. They all told me that the setup costs to make an (extruder) tool are disproportionate to the amount of required profiles. Although the final product is nothing more than a plastic profile. In my car were original Fury strips. These are plastic transparent profiles with silver/gold paint from the underside. Except one break point at the end of one strip, they are in good condition. I used them to make the CAD drawing. Also I think they could be reused I did not reinstall them. I used my repros, which have a chrome finish. I would give the originals away if someone wants them. Because of the length, oversea-shipping costs would be high! Finally I found a way to work with a company together. They made some 20 strips for me. Although they also have setup costs which push the price high, no chance for a cheap way. Material is grey PVC, very durable but still pliable. Transparent plastic like the original is impossible. So for the final finish, they have to be painted or foiled. A perfect finish would be the “coverchrome” method, which is a perfect chrome paint. I successfully tested it on the fiberglass oval air cleaners, bezels and grille. But my guy doing it had no time. So I used chrome car foil, also coming out nicely. Photos of testing and comparing old/new retainer strips. Please note that the “prototype” was in lack of 2 additional groves (like the old one has). But the PVC material is too stiff. It cannot be pushed on the steel bow. I added the grooves later and it worked perfect after that. No problem installing them. They clip on the steel bow smoothly and hold. I used 2 strips for myself and sold all 18 remaining ones. They were bare, without any coating. Price was: $85 piece / $170 pair, shipping: $50. I will not make them again because forum member Mike2nd announced he will make them, maybe better and cheaper. Actually I´m working on these parts as repros, also based on 3D drawings 3D prints and mirror chrome paint. • Forwardlook emblem, which comes on the rear shelf cover in the recess between the seats (only Fury model) Already sold a couple of them on ebay for $55. Awesome thread Andy! I've made this a sticky so it should appear at the top of the forum section from now on. I'm in need of 1 end cap. Let me know when they are ready! 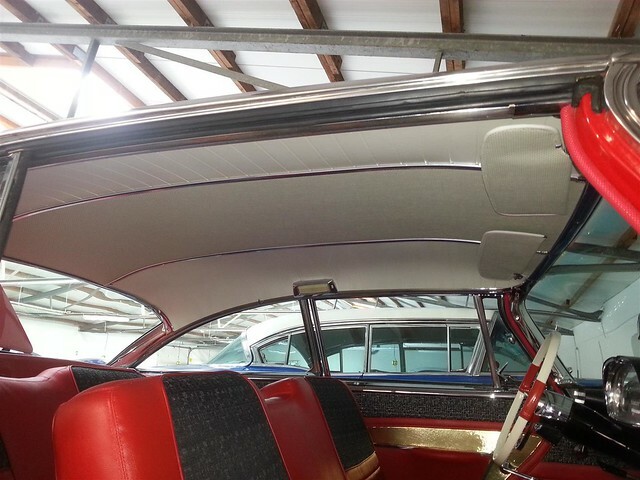 This isn't the first time Andy's posted some very beneficial information regarding our 57-58 Plymouths. Last time he posted all the VIN decoding information that use to be on Plymouth Central. I was able to figure out quite a lot about my Green Christine. Thanks again Andy. I do believe you are someone trying your best to live by God's golden rule. I really appreciate your efforts here at the CCC. You´re welcome. Sorry that I did not post it earlier. I wrote it some months ago with MS Word, first not for any club in particular. Then posted it here and there. Hope I got them all now! I´ll keep you updated with the replicas. Wow, thanks for posting this Andy! 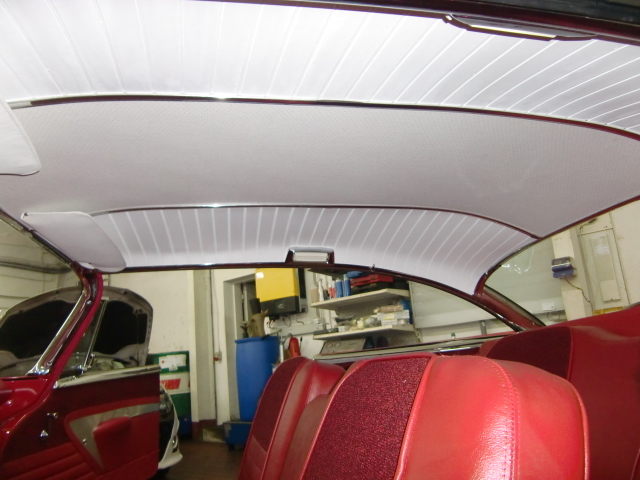 I am sure that this will turn out to be very useful for anyone who needs/wants to restore the headliner on their car.